Two men died when their fast-moving car struck several trees, ejecting them. 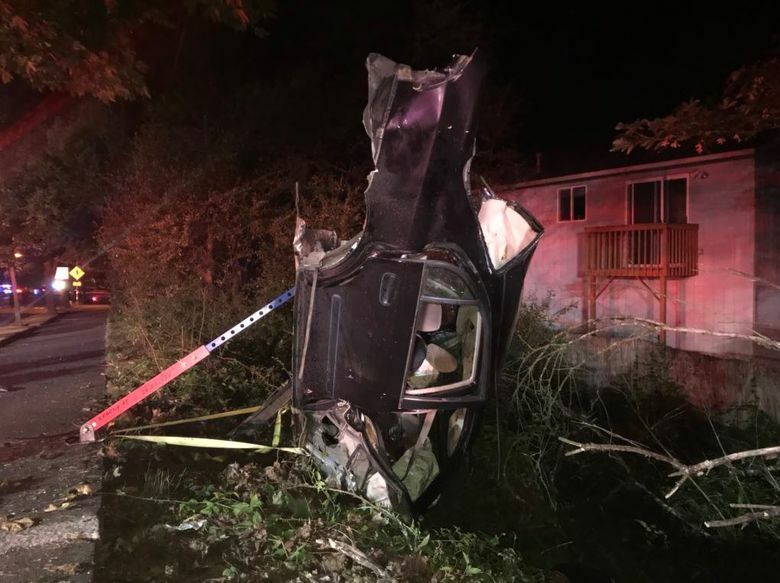 Two men were killed early Wednesday in Federal Way when their fast-moving car crashed into several trees. The single-car accident occurred at 2:17 a.m. in the 800 block of Southwest 320th Street, according to Federal Way Police Cmdr. Kurt Schwan. The men were traveling in a Honda Civic at a high rate of speed when their car left the road, striking multiple trees and tearing the vehicle in two, Schwan said. The men were ejected from the car and pronounced dead at the scene by South King Fire & Rescue. The men, whose identities were not released, were between the ages of 25 and 30, Schwan said. He said alcohol appeared to be a factor in the collision.